I'm thinking I want one or two of those Black Legions I keep seeing popping up every so often. Flatline used them recently, they looked great. Where do ppl get them? and how much do ppl get them for? Need one Legacy collection Darthvader if there is one for my buddy. He has tons of Joes to trade loos and MOC just ask what your looking for Joe wise I'll let ya know if he has it and i willing to trade. Check with The Black Major, he makes them. He lists on e-bay and maybe through pm's. Here are the Vipers im looking to trade for 2 25th Vipers, 2 DOCI Alley Vipers or Jungle Vipers. Anyone got a Desert Viper Bandana and goggles? Kinda hurtin for some! I'd be willing to trade or cash! 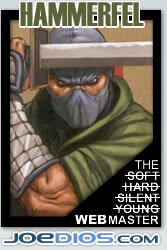 I'll even take the bandana from Extreme conditions Major Bludd or Comic Pack Beach head and goggles from Desert Zartan! I can help with the beachhead bandanna. Goggles, sorry on your own there. PM sent. Is for constructive criticism (will even settle for destructive) just anything but "Nice shot" or "Awesome". ROC Ice Dagger, Sky sweeper, Night Raven, & Rockslide (and any Target exclusives) Serpent armor, jet pack, claw glider, Jet ski's. 2.5 sigma Night ops vamp and iron hammer mech. Last edited by samsallspark : 07-20-2010 at 03:42 PM. Here is some of the stuff I have for trade. I will be adding to this as I am able. 2009 Kamakura - (resorted to Ebay) - Need this for future dio chapters. Last edited by Hammerfel : 07-28-2010 at 07:59 PM. 2009 Kamakura - Need this for future dio chapters. I've been finding Kamakuras for people at CVS/Walgrees/etc stores for people. It is inflated prices, but not ebay inflated. I'll go looking.